Dirk Oellibrandt is the founder of Meridian Chi Kung. His body was his teacher herein. Meridian Chi Kung is a series of exercises that stimulate the flow of energy in the meridians. The exercises are designed to initiate an energy flow that opens the meridian network and creates space internally. It is a playful and inviting form that gives joy to the body. By doing these exercises regularly, you will feel that the external movements help you to feel the internal movements of your body. In that way, you can increase and improve your life energy significantly and the intelligence present in your body, will be able to show itself. The movements are linked to the 5 elements (metal, earth, fire, water and wood) and the connected meridian couples. Moving within the elements in yourself, becoming familiar with how the various elements show themselves in you and developing the potential that lies therein. The alchemy process is started. Moving “inside the elements" is not just exercising, training, or making beautiful movements. By being consciously, presently and silently in your movement, at the same time, both your body and mind change. The start of a new, conscious life in your body has begun. The exercises are designed so that everyone can practice them in his own way. 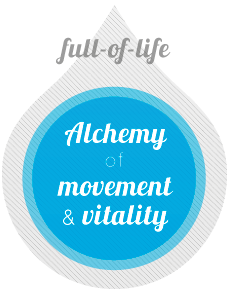 Regularly repeating the movements builds inner strength and awareness in the different dimensions, the physical body and the emotional, mental and spiritual dimension.